Today we mixed things up with Tribal-Palooza! Instead of going to our normal activities, we played evening activities all day. Today is a huge day for the Seminole and Iroquois tribes. There are so many points for the banner on the line. Tighten those shoe strings, it’s time to compete! Archie D., Jay S., Dylan C., Parker C., Henry F., Jack G., Enrique D., Carson H., Rawson B., Geoffrey M., Daniel Y., and Keegan K. These tributes spent today fighting Hunger Games style (using foam noodles, flags, plastic shields, and rubber balls) for the tribal victory and their place in history as champions. 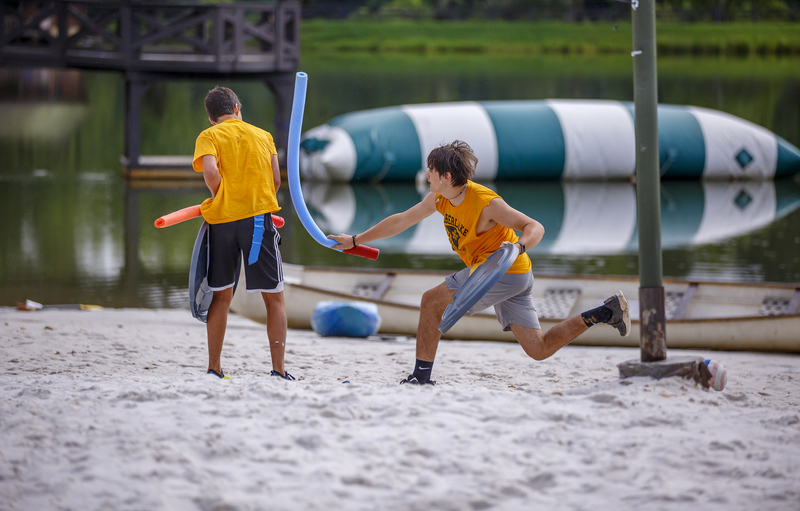 The rest of camp battled staff in various activities for sponsorships and the Jr. Camp played a huge game of capture the flag to earn their tribe walkie-talkies. The Seminole tribe won walkie talkies for their tribe which came to be a great advantage as the last for tributes standing in the games were the Seminoles Daniel Y., Geoffrey M., Carson H., and Keegan K. But, in the Timberlake Games, there can only be one victor. Betrayed by their tribe, Keegan K. and Geoffrey M. joined the rest of camp to watch the grand finale between Daniel Y. and Carson H. “Two men enter, one man leaves!” is chanted as the final two tributes eye each other in the cornucopia. The victor…Daniel Y! Congratulations Seminoles and Congratulations Daniel Y. on this epic victory. The Hunger Games is a 6-hour long adventure, strategy, and survival game. So, while it was transpiring, there were a few other events occurring. There were a few guys who went on an electrifying water-skiing trip. Mathew A., Mitchell B., Carson G., Court J., George P., and Jakob D. Also, while the Timberlake Games were occurring, the tribes competed in the tribal activity El Presidente. While playing El Presidente, you could see the Timberlake Games’ tributes chasing after each other in the distance. Now we have reached our regular scheduled programming, the evening activity in the evening, where it rightfully should be! The night ended with upper cabin ultimate frisbee and lower cabin Behind Enemy Lines. After a busy and rewarding day, the guys are heading to sleep. Tune in tomorrow to see which tribe earned the most victories from today’s Tribal-Palooza.